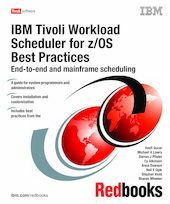 This IBM Redbooks publication serves as a reference for system programmers and administrators who will be installing IBM Tivoli Workload Scheduler for z/OS in mainframe and end-to-end scheduling environments. Installing IBM Tivoli Workload Scheduler for z/OS requires an understanding of the started tasks, the communication protocols and how they apply to the installation, how the exits work, how to set up various IBM Tivoli Workload Scheduler for z/OS parameters and their functions, how to customize the audit function and the security, and many other similar topics. In this book, we have attempted to cover all of these topics with practical examples to help IBM Tivoli Workload Scheduler for z/OS installation run more smoothly. We explain the concepts, then give practical examples and a working set of common parameters that we have tested in our environment.